Home › Bibliography › The Lure of LACMA. Vanity Fair, N0. 676, Nov. 2016, pp. 138-139. Photo by Art Streiber, 2016. 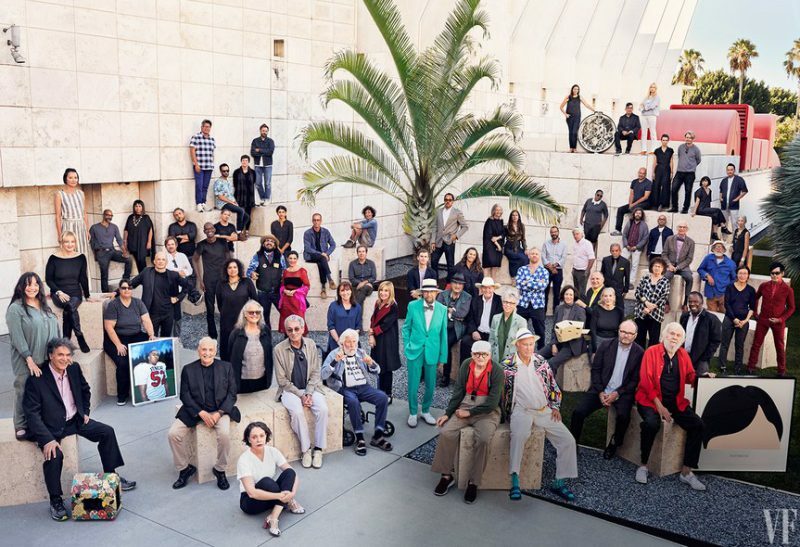 Eleanor Antin, Tony Berlant, Mary Corse, Anna Sew Hoy, Rodney McMillian, Catherine Opie, Patssi Valdez, Michael Maltzan, Mark Hagen, Walead Beshty, Frank Gehry, Kulapat Yantrasast, Mark Bradford, Alex Israel, Sterling Ruby, Sherin Guirguis, Amy Murphy, Happy Price, Diana Thater, Ricky Swallow, Mario Ybarra Jr, Toba Khedoori, Peter Alexander, Karla Diaz, Adam Silverman, Ellen Grinstein, Ed Moses, Joe Sola, Emily Mast, Ayn Grinstein, Edgar Arceneaux, Cayetano Ferrer, Sidney Felsen, Larry Bell, Sharon Lockhart, David Hockney, DeWain Valentine, Lorraine Wild, Joni Weyl, Mary Weatherford, Billy Al Bengston, Thomas Houseago, Sam Durant, Sharon Johnston, Analia Saban, T, Kelly Mason, Brenna Youngblood, Fred Fisher, Helen Pashgian, Harry Gamboa Jr, Thomas Demand, Ken Gonzales-Day, Ry Rocklen, Anthony Pearson, Lesley Vance, Judy Fiskin, Kaz Oshiro, Alex Prager, John Baldessari, Michael Whitney, Carter Mull, Charles Gaines, Liz Glynn, Mark Whitney, Glenn Kaino, Alexandra Grant, Yunhee Min, and Willie Herrón.